Comida de inspiração alentejana com toque de Autor. Embarque numa viagem gastronómica única e prove os sabores tradicionais da gastronomia local, os quais se fundem harmoniosamente com a cozinha mediterrânica. 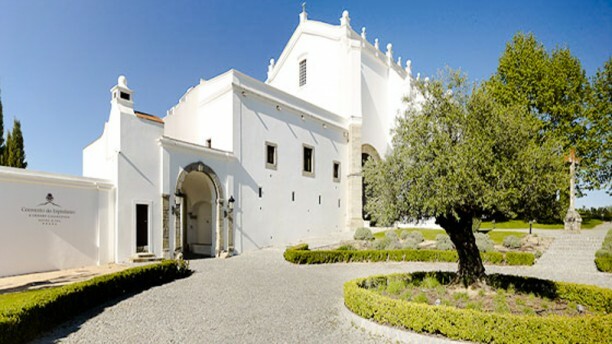 Localizado na antiga Adega do Espinheiro, utilizada pelos monges, o Divinus é um restaurante gourmet que oferece como proposta gastronómica a cozinha mediterrânica com sabores do Alentejo. Uma experiência única num ambiente preenchido pela riqueza do património. O espaço é requintado e elegante e o serviço muito eficiente. Totalmente recomendable especialmente la Raya, un plato que se debe probar. Our reservation was made the night before and we had no issues checking in. The front desk explained that there was a wedding at the same time, but there were no concessions made to our service. We had an impeccable evening. My wife and I thoroughly enjoyed our entire dining experience. We especially liked the innovative and tasty chef’s Tapas course. Our main courses were also excellent. The service and atomosphere is outstanding. My husband ordered the beef “steer”. He commented that it was probably the best he had ever had: cooked medium rare (exactly as requested) and seasoned perfectly. I tasted it and would have to agree that it was delicious - and yet we live in Kansas City where steaks are famous! An genuinely enjoyable and professional experience. Can not fault the staff or the food. Thank you for such a great evening! Outstanding in every way, just exceptional. No praise too high. Rip off. Before your meal arrives they offer an amouse bouche, with compliments from the chef (pretty normal), but then add 23 eur per person for this "offer" to your bill. Bottle of water costs 5.50 eur! Decent main and pretty good desert overall, but insanely expensive and not worth the money. Lovely restaurant. Excellent service, nice atmosphere and interesting food. Liked the fact that the portions were not the huge portions we have found everywhere else in Portugal. Lovely meal. Made a date error and instead they seated us the night we arrived (one day after the reservations) we stayed in the convent and the restaurant is in the old monk's wine cellar. Expensive for Portugal but nice ambiance,service, and quality. Restaurant is hard to find!